2.50-17 Front tire for CT90 Rear Tire for Passport Rear Tire a bias construction with a load/speed index of 47P. 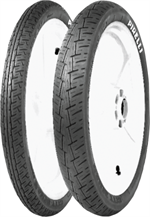 Blackwall tubeless non reinforced tire. A tire for town and country journeys, safe and reliable on all kinds of road surfaces. Honda Exhaust Band Protector to fit your stock Honda exhaust for the following models and years: Ct70 1970-1982; CT90 1966,1969-72 and 1974-79, S65 1965, Ct110 1980-1984, 1986, CT200 1964 and CL70 1969-72. It is #2 in the diagram. Honda CT70 Exhaust Shield Oval Screw these are the replacement screws from Honda for your heat shield on the stock muffler. Please see #20 in diagrams. 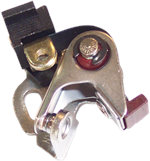 Will fit: CT70 1970-82; CT90 1970-72,74-79; CT110 1980-86; and CL70 1969-72. 8mm Acorn Nut that will cap off the exhaust/shock bolt. It is #22 in the diagram. Will fit many different models. Clone/Replica CT70 TOOL KIT- not meant for stock Honda bikes. CT70 Exhaust Baffle/Diffuser for CT70 1970-1994, CT90 1969-1972;1974-79. #9 in diagram. Ignition Points for the CT90. Will for other models. Please see full web version for more fitment years.